(Official Star Wars website)Darth Maul in "Star Wars Episode I: The Phantom Menace"
While everyone is pretty much focused on December's "Star Wars Episode VII: The Force Awakens," one question looms: where is Darth Maul? With no canonical death, IGN tried to speculate on what happened to Darth Sidious' former student. 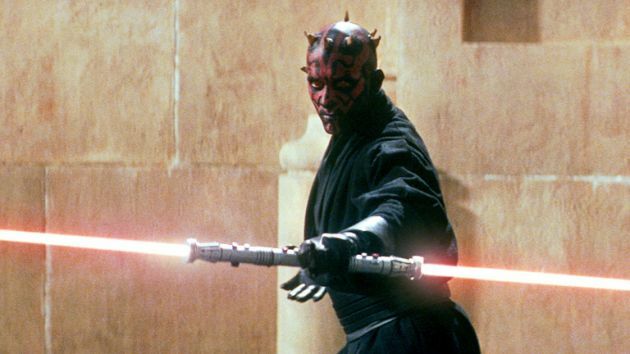 Darth Maul first made his appearance in the prequel movie, "Star Wars Episode I: The Phantom Menace" via Ray Park's acting and Peter Serafinowicz's voice. He also was a central antagonist in the animated series, "Star Wars: The Clone Wars," as voice by Samuel Witwer. He went into final battle with his former mentor, Darth Sidious, but lost. He, however, escaped thanks to Mother Talin's sacrifice. With no canonical death — either on-screen or the comic book pages — a lot are asking if he is still alive or if he indeed met his end. IGN writes on his Wiki page, "Maul's whereabouts are now unknown. He...might well have endured into the Rebellion era or even beyond." This curious lack of information on Darth Maul's current location makes him and his story from then to now an interesting storytelling angle. But as Darth Maul's storyline is too far away from the upcoming sequel trilogy and also the anthology series, he might not get some screen time any time soon. There are also no updates on whether Marvel Entertainment and Disney have plans to continue his story. Fans, however, are doubtful of his existence, especially after being cut in half and falling through an exhaust port. Some defend, though, that anger is a powerful thing, making Anakin Skywalker an example. He was pretty much burned by lava falls but still survived and turned out to be one of the greatest Sith Lords in Darth Vader. With or without Darth Maul, though, the upcoming "Star Wars" film is creating a huge force among fans. "Episode VII: The Force Awakens" hits theaters this Dec. 18, 2015.